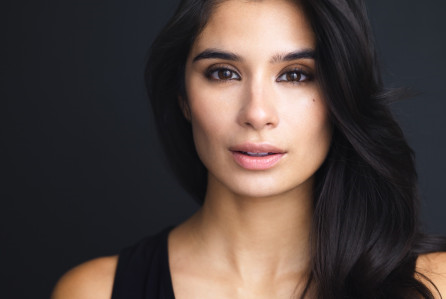 BROWNSVILLE — With a clear message of the need for the Latino community to be better represented, respected and unified, Diane Guerrero addressed a crowd of about 500 students at the University of Texas Rio Grande Valley on Thursday. Guerrero is an immigration reform activist, author and actress, known for her role as Maritza Ramos in the series Orange is the New Black and Lina in the series Jane the Virgin. She visited Brownsville for the first time as part of UTRGV’s Distinguished Speaker Series. “This is my first time close to the border,” she said. “I’m sure my parents have seen it a few times, shout out to my parents,” she added jokingly. Guerrero, 31, began to openly share her personal story about three years ago of how her family was divided by the current immigration system. Her parents and older brother were deported when she was 14. Born in New Jersey, Guerrero always knew that her family was undocumented and even recalls hearing concerning conversations regarding all of the “what ifs” that this status comes with. Coming home from school to an empty house was a major cause of stress, she said. That exact fear became reality one day as she came home from school to a half-prepared dinner, lights on, and an empty house. Her neighbors relayed the news. Putting her painful story out in public wasn’t easy, she said, as at the time she was still trying to get into an industry that continued to tell her that she wasn’t good enough. But that continuous rejection helped her realize the roles she was seeking were not fully representative of who she is and what she had to offer as a Latina. Her story and that of so many Americans who come from families facing similar immigration issues is a true American story, she said, that tends to be ignored by those portraying the community in movies and television. It has been 16 years since her family was taken away and while there have been some temporary solutions offered for undocumented immigrants through those years, such as DACA — Deferred Action for Childhood Arrivals — the country keeps taking steps back in the matter by trying to do away with such protections and not focusing on passing a permanent solution, she said. She plans to continue telling her story so those with similar backgrounds can see there is a community backing them and understanding exactly what they are going through. She also urged those present to share their own accounts, stating there is nobody out there with the exact story, but there are many who can relate to similar experiences and need the moral support.